For all of my United States readers, I wanted to let you know about a fabulous contest that Playtex currently has running. All us women know that there is nothing more frustrating and distracting than a badly-fitting bra. The Playtex Bra Makeover is going to be awarding ten lucky women a trip to New York City for a professional fitting. After, the women will each star in their very own episode of The Playtex Bra Makeover series. If you are constantly fighting with uncomfortable straps, riding backs or bulging cups, this is the contest for you. Check it out today! Wow! In the near future, I have been given the chance to do a review of CSN Stores, the amazing conglomerate of over 200 online stores where shoppers can find anything from a sofa to a sippy cup. The great one-stop shopping experience of CSN Stores looks like a wonderfully convenient way to obtain everything you need for your family without ever leaving the comfort of your home. Needless to say, I can’t wait to see for myself why so many people love CSN Stores. Look for the review soon! To all of the wonderful, fabulous, hard-working and fun-loving mothers out there…Happy Mother’s Day! Here are a few inspirational quotes for the mothers of the world. I hope you all have a wonderful day full of as much rest, relaxation and family fun you could wish for! When I found out that I was pregnant with my second child, I knew that my workload was going to increase. I spent countless hours preparing my son for the arrival of a new baby, stocking the house with diapers and filling the freezer with pre-made meals. Of course, I knew I had some busy days ahead of me. But I had everything under control. Then I gave birth to a sweet new baby boy and suddenly, nothing was under control. Looking back to that time only a few months ago, I cannot believe how unprepared I was for the demands of two needy children. In between caring for a quickly growing breastfed baby and constantly monitoring an incredibly mischievous preschooler, I discovered that I was constantly on the go from morning until night. Fortunately, Lindsay Harris, founder of Glow Baby, understands. When Lindsay first faced the difficulties of caring for both a toddler and a newborn, she created a tracking log to keep track of her new baby’s feedings, diaper changes and naps. The log helped her to quickly understand and optimize her new baby’s routine, which in turn left her with more time to care for her oldest child. The tracking log was so effective that she decided to create a similar tool to help parents everywhere adjust to their new baby’s routine. Baby’s First Journal was born. With handy columns to record feeding, changing, sleeping, vitamins and baths, Baby’s First Journal is a must-have for any parent with a newborn. As well, since the creation of the Baby’s First Journal, Glow Baby has added other organizational tools for busy families. 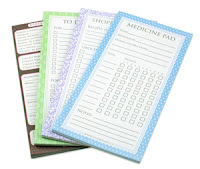 Neat and stylish shopping lists, medicine pads and to do lists are all available. 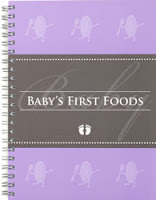 For older babies, Glow Baby has just introduced the brand new Baby’s First Foods journal. This extremely useful and well-organized book allows parents to record their baby’s introduction to solid foods in order to detect allergies, determine favorite foods and plan menus. The logging sections are divided by grains, veggies, fruits, protiens, dairy and snack, and include a sample page for suggested use. The book even includes sections for favourite recipes and contact numbers. Glow Baby products are conveniently sized for purses or diaper bags and make a great gift idea for pregnant women or new mothers. Any parent would love these beautiful and useful books. Disclaimer: Opinions expressed belong to Mommy Kat and Kids and are NOT influenced in any way. Mommy Kat and Kids is holding a giveaway to celebrate the upcoming official launch of the website. Up for grabs is a cute and trendy Revive Shower Gel kit. Women everywhere know that nothing helps you get up and go like that fabulous and essential morning shower. And with three invigorating scented shower gels to choose from, starting the day with a spring in your step will be a little bit easier. This fun and functional kit contains Tangerine, Ocean and Watermelon scented shower gels. As an added bonus, it even has matching foam bath poufs to add an extra touch of colour to your morning. Enter now, and be the first to know about all of the great giveaways Mommy Kat and Kids will be offering!